Home / Blog / HowTos / How Much Does It Cost to Hire a .NET Developer in Ukraine? How Much Does It Cost to Hire a .NET Developer in Ukraine? We are sure you heard about .NET technology at least once. But what do you know about? The Microsoft owned language is getting popular now. In 2018 a big quantity of websites uses .Net technology. According to the W3Techs information, more than 12.1% of the websites whose server-side programming language is known to use the ASP.Net technology for their server-side software programming. Thus, it is one of the most popular server-side programming languages in the marketplace. A large majority (86.5%) of those websites use the .NET version 4. The .NET platform stands second after Java and followed by PHP in the global market share of the server-side computer programming languages. According to the Datanyze Research website information, there are more than 2,596,056 online websites powered by the ASP.net platform across the globe. ASP.Net stands second with 24.62% of total global market share of the server-side programming technologies. The number of websites going offline is 3 times lower than the number of websites going online per annum. Thus, the over demand for .Net is very high, which pushes the salaries to new highs. Interesting that the US has the biggest part of the websites done with .NET, while Ukraine has just 8,357 live sites. Talking about the outcome of this programming language existing we have 1151 projects that are done with .NET around the world. The list of top websites built with the ASP.NET technology includes Microsoft, DELL, GoDaddy, StackOverflow, Visual Studio and many others. Owing to the strong competition from major server-side technologies like PHP, Python, Django Ruby and the likes the market share of the .Net platform has decreased a bit as compared to the previous year’s market share value. 20 years have gone since the very first version of .NET was launched. A lot of things has changed for these years, but an app development too. Innovative .Net application development services enhanced and improved, so now, as the year is coming to its end, we can see the results of the reinvented new framework of .Net for a developer. Microsoft is extending its ability to be used for any platform. A developer can get any device and any platform with the help of .NET technologies. The opportunities for this technology tends to get more endless. Thus, the popularity of ASP.Net platform as well as the demand of dedicated .Net developers and .Net development teams will increase consistently with the emergence of the revamped and improved ASP.Net technology. How Has ASP.NET Core Improved Web Apps? ASP.Net Core has many powerful features, capabilities, and qualities that make it one of the most popular server-side web application development platforms in the marketplace. It combines both the traditional .Net MVC and the web APIs in a single framework so that developers can find it a comprehensive development platform. The last version of ASP.NET.Core 2.0 is just steaming hot, as it supports .Net Core 2.0 and a great number of different improvements. It just one of the things to be excited about. This web framework is one of the quickest technology, which is full-featured. Also, it can be used for mobile apps as a really quick API backend. The ASP.Net Core is very popular for developing enterprise web applications owing to widespread support for multiple platforms, technologies, and operating systems. It is a more modular and leaner platform to offer full flexibility to the web application owners and web developers. The features of Razor page, improved testability, high performance, and code reusability have made it one of the best choices of the dedicated .net developers in the marketplace. What Should You Know About .Net Core? Easy to learn. The syntax is easy to understand and read. A lot of developers make the transition from Java to C.
.NET – universal. Templates of ASP.NET Core can even use Bootstrap and npm layouts to get client libraries. Versatility is a big deal because investing in learning a language can be used for a wide range of things. Modern language functions. .NET is constantly changing and improving. With .NET Core, all ASP.NET stacks that have been carefully redesigned. Fast Execution. The ASP applications being located the server in fully compiled format requires less time to load and run. Thus, the execution of the instructions is very fast to provide the better performance of the application. Selection of skills. The .NET Framework contains a large number of base class libraries. Accordingly, a wide range of base classes significantly reduces the need for external packages. Microsoft can be proud of a set of procedures and templates for .NET. Most developers of .NET software companies use a standard framework. This simplifies the work of the developer between the teams and speeds it up. Robust Security Features. Offers high-level of security features such as Windows Authentication and others. Code Separation. ASP.net supports the features to separate the computer code logic from the business presentation to make it more robust in class-full isolation of application data. NET Core is open source. This is a major advantage over other technologies and languages. Professional Outsourcing. It is very easy to hire net developer Ukraine fully dedicated to your .Net projects to create great quality and user experience. Nevertheless .NET developers are not as demanded as Java or C, there’s still a great need of them nowadays. Projects, created with the help of Microsoft tools are quite rare, that’s why it’s not that easy to find and hire a dedicated .NET development team with rich experience behind their backs. It may be useful to know that employers also tend to search for programmers with knowledge of C# (as they are closely tied together), Java, ASP NET development and SQL while requesting .NET developers. So if you have experience in above-mentioned techs, be sure that you will be demanded. A consistent demand for dedicated net developers will remain in the marketplace for long, especially in the field of enterprise web application development and professional grade website development. The demand for the software developers in general and the demand for the .net programmers in particular is very high in the marketplace. According to the Robert Half information, there are three main reasons for not being able to hire net developer easily. Those reasons include the knowledge of the skill set for a good dot net programmer, longer hiring processes at company’s end, and the companies demanding lofty skill set and expertise without investing some time and money on training. Thus, hiring a .Net developer is really a bit difficult in the market. Since many programmers nowadays have the desire to work with big projects and companies are looking for such candidates, there is an easy way how they can meet each other. It is outstaffing. In case you are not familiar with the outstaffing process of hiring – it is quite simple: if you are looking for PHP programmers, for example, you apply with your request in a company which provides staff and it finds ideal employees for you, whether you want them on a temporary basis or for a long term. The company’s recruitment team is responsible to hire NET developers for you, they select the proper .Net developer interview questions and tests, providing you with .Net developer resume. Obviously, it takes a lot of time to do that and you don’t have to spend it. If you are interested not only in .NET developers and .NET development company, Ukraine offers, but in the ones with other obtained skills as well, check out this research with more information on this point. There are many other options to hire dot net developer Ukraine through Mobilunity. The NET development Ukraine industry is extensively powered by outsourcing and outstaffing models of hiring. You can choose the project based dedicated development team that works only on your project with full dedication and concentration. Hiring on hourly basis is also an option to choose for a particular task. You can also choose the fixed price option for a particular software development task to complete it within the specified time period. So, the different formats of outsourcing and outstaffing hiring are the best ways for the remote companies to hire net developers Ukraine easily. As you can see, salaries may differ vastly, depending on the level of acquired knowledge and the scope of the project. If companies, which hire ASP NET developers, are small and all tasks are quite simple, then the minimum or average senior ASP.net developers salary can be paid to the programmers for their work. In case it’s a long term contract and the project is huge, the company pays much more for the performed job. 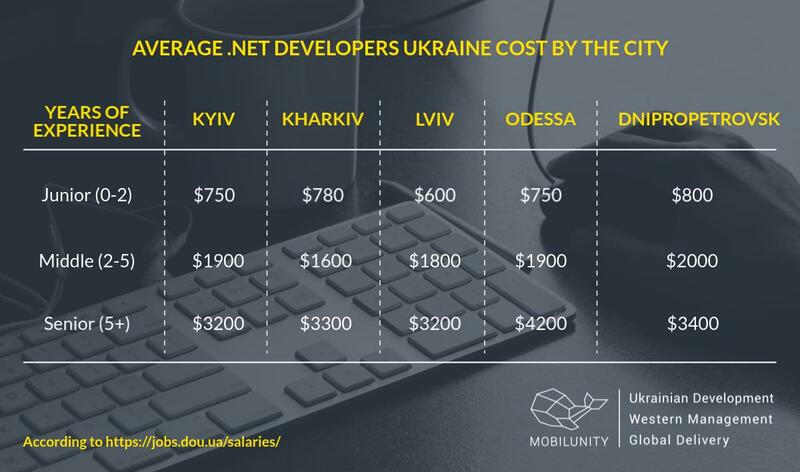 In the table above you can see that Odessa offers the highest payment to the senior .NET developers, along with Dnipropetrovsk, which pays quite good junior .Net developer salary along with entry level .Net developer. 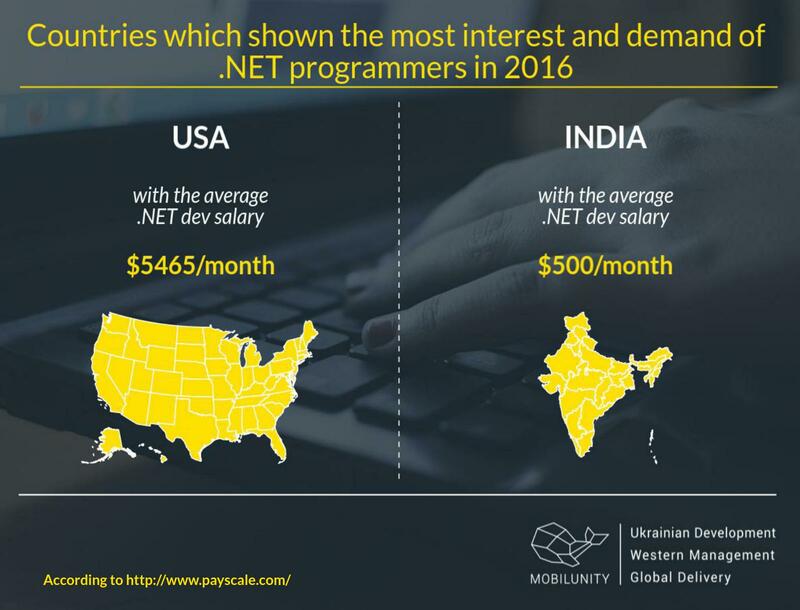 In 2019 USA and India were searching to hire ASP NET developer the most, but you can see, that they offer dramatically different salaries for the same type of work. Like other major disciplines of software development, the average salaries to hire .net programmers in the USA are very high. According to the latest survey of Zip Recruiter website, the average salary to hire dot net developer is about $96,242 per annum. The entry level developers get about $41,500 per annum, while more than 11% of the people get salary in the range of $156,500 to $168,000. More than 19% of the .Net programmers get paid in the range of $76,000 to $87,499. From these statistics, it is very clear that the .Net developers earn substantial amount of money in the industry. Similarly, it is very important to note that the ASP.Net is a platform, which uses multiple programming languages, tools and frameworks. The salary may vary with the expertise level of that particular programming language, tools or other software platforms. .NET developers continue to move the slow trend of the language. Statistics showed month compensation of $7,365 in the USA on average. German and British senior developers are encouraged for Microsoft-focused developing with the salary of $5,821 and $4,150 per month. In terms of the global market share, the ASP.Net is the second largest platform in the web development software industry. The global market share of .Net platform is about 34%, preceded by the market leader PHP platform. The Ukraine market is the fourth largest pool of .Net developers in the world. The demand for the dot net developer is also very high and consistent with a little fluctuation. According to the PayScale statistics, the average salary to hire net developer is about $28,030 per annum. Different companies pay in the range of $11,000 to $15,000 to hire net developer at an entry level in Ukraine. But, the average salary of a senior .Net developer is comparatively high. The average salary of an ASP.Net developer is about $37,540 per annum. The average salary for a particular level of the career in .Net field varies with respect to skills, area, and cities in the country. There are a lot of .NET developers in Ukraine, but the majority of them are dominated by Junior. Many .NET developers do not understand how TPL, LINQ or async/await work. As a result, there is a gap between Junior and Senior. Either a person knows how to fill in lines of code by example, without understanding how it works, or he can understand the platform better than you. There is an acute shortage of team-leaders in the Ukrainian market. And the average annual Python developer salary in 2018 is $37,540, making the monthly salary of Ukrainian experts $3,130. But Mobilunity solved this problem by hiring the best-dedicated specialists into the team. What Are the Best Interviewing Questions for .Net Web Developer? Q#1 Give an explanation to the concept of encapsulation of .NET. There are four basic features of OOP, so encapsulation exists as one of them and refers to the adding within necessary data for the object for functioning. The interviewee should mention that encapsulation helps to keep data from undesirable access through binding code. Q#2 What is a delegate? Test a basic knowledge of a frequently used term. A delegate encapsulates a reference to a method – that how should sound the answer. Also, it is good to add that it has the advantage of being type-safe. Q#3 When it is better to use .Net Web Forms whether ASP.NET MVC? Q#4 How are an interface and an abstract different from each other in terms of .Net platform? The fields are declared in the abstract classes, which are normally used as the base class. An abstract class offers virtual members, which the inheriting entities are supposed to deploy. From the abstract class, a developer is not able to create an object normally. As compared to the virtual class, an interface is able to create, without any access to modifiers, events, properties, and methods. The interface assigns a contract, which should be available in the implementing classes. Q#5 How will you explain LINQ in .Net environment? Language Integrated Query is precisely known as LINQ. It improves the capabilities to query the database by adding a set of powerful features and new standards of query operators. Thus, LINQ query allows the .Net platform to manipulate the data deeply irrespective of its source. It supports multiple data sources like MS SQL Server, XML docs, ADO.Net, Dot Net Framework Collections, and others. This capability was adopted in 2008 with the launch of Visual Studio 2008. Let’s take a look at the samples of .Net developers CVs provided by the level of expertise. Highly skilled, experienced, knowledgeable technical talent market. 4th largest market of .Net developers in the world. Offers highly competitive prices in the world. Offers high-quality software development with 100% success rate. Guaranteed and successful completion of the project on time and within the budget. Powered by highly professional management teams. Ideal geographical location for all major regions like Western Europe, North America, and Asia Pacific. 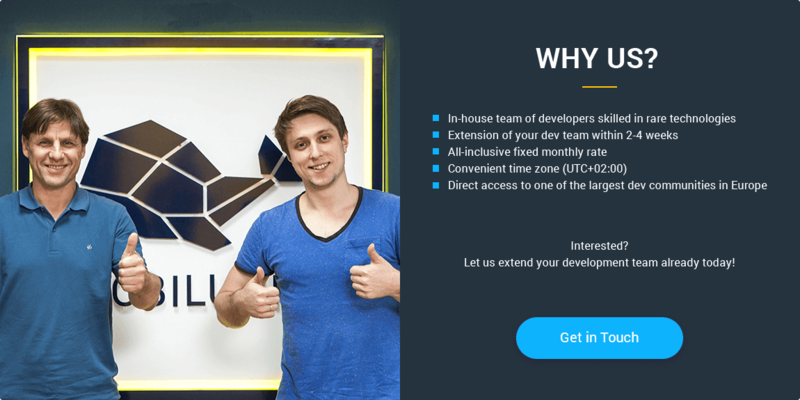 Offer dedicated .net development teams that work remotely on only the projects they are hired for. Mobilunity will gladly find the right ASP.net developers for ASP NET development company. We are ready to provide you the best candidate within 2-4 weeks. Looking for Net developer for your upcoming project? Let us find and outstaff right candidates for you!